Today's post is courtesy of our registrar, Meghan Grossman Hansen. In this post, Meghan examines the interaction between the fashionable silhouette and the human body in the second half of the nineteenth century. You'll also get a sneak peak at two day gowns featured in our upcoming exhibition, FABULOUS! Ten Years of FIDM Museum Acquisitions, 2000-2010. 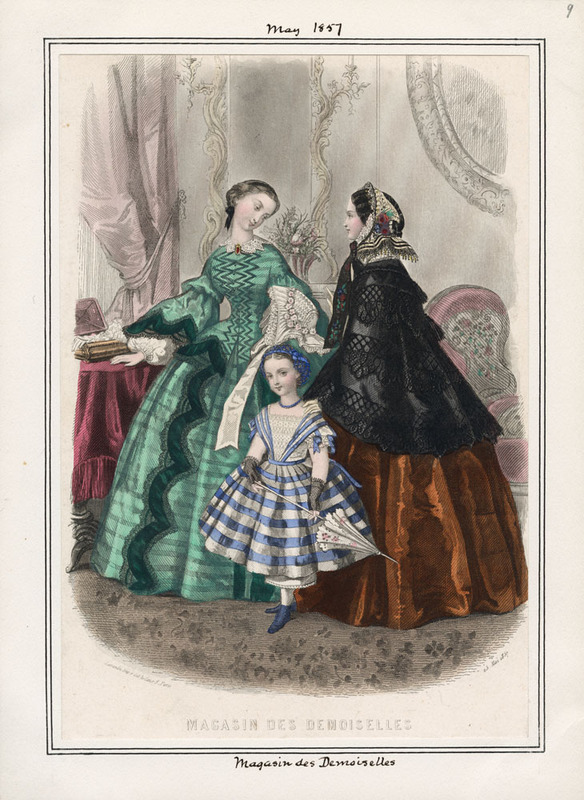 As a fashion museum professional, I spend a lot of time looking at fashion plates. By examining these beautiful illustrations, including this one from the Los Angeles Public Library, the researcher becomes familiar with the fashionable silhouette in its most idealized state, an important part of learning about the history of fashion. And yet, on a daily basis, I work with clothes that were worn by actual women, not the idealized figures of fashion illustrations. This dichotomy of ideal and real comes to life when we dress a historic garment for exhibition. This late eighteenth century corselet is a bit of a puzzle. Structurally, it's akin to a corset, complete with boning throughout. Despite its similarity to a corset, the surface embellishment, including small metal disks, metallic galoon lace and two vertical rows of ornate metal hooks, certainly doesn't lend itself to being worn as an undergarment. Given its dimensional surface embellishment, this corselet was definitely worn over another garment. But in what context? Was it fashionable dress, fancy dress or an example of regional dress? Given that underwear as outerwear wasn't a part of late eighteenth century or early nineteenth century fashionable dress, it is either an example of regional dress or part of a fancy dress costume. A recent debate in the New York Times asked, Has Globalization Ruined Street Style? The question itself is premised on the belief that the combination of extensive social media networks and global clothing retailers have eliminated regional variations in dress. Though the debate participants had differing opinions about whether globalization has been good or bad for street style, it is undeniable that globalization has softened obvious differences in global dress. Subtle differences exist, but they are usually found in small details or overall styling. The article made me think about designers with a a primarily regional following. Holly Harp, who worked in Los Angeles and drew inspiration from the glamour of Old Hollywood, is one such designer. Another is Pedro Rodriguez, a Spanish designer largely unknown outside of his native country. Rodriguez had a long career, opening his first salon in 1918, and didn't retire until the early 1980s. If by some lucky chance you'll be in Barcelona in the next few days, an exhibition titled "What to Wear?" focuses on his work. Our Pedro Rodriguez pink silk faille evening sheath dates from c. 1965. We are delighted to announce our next exhibition, FABULOUS! Ten Years of FIDM Museum Acquisitions, 2000-2010. Opening on September 13, 2011, this exhibition will showcase an unprecedented array of dress and textile objects from our collection, including this c. 1886-87 reception gown. Throughout the run of the exhibition, we'll feature occasional blog posts on selected objects in the exhibit. This exhibition celebrates the past decade of collecting at the FIDM Museum in Los Angeles. With a surge in extraordinary donations and purchases between 2000 and the present, the FIDM Museum collection attained new eminence and richness, particularly in the areas of 19th- and 20th- century haute couture, mid-20th century American designers, and international contemporary designers. In assembling this collection, the museum has adhered to uncompromising standards and acquired only items distinguished by superior design, the highest level of craftsmanship, and the finest materials. The exhibition includes 175 donated and purchased garments and accessories worn by women, men, and children spanning 1800 to 2010. FABULOUS highlights include: a white gauze French empire gown, a luxurious embroidered court suit worn by composer Johann Hummel, a Redfern court gown with regulation eleven-foot-long train, and a museum-commissioned lace peacock motif Alexander McQueen couture gown. Accompanying the exhibition is a fully illustrated 375-page catalogue. This Baccarat perfume bottle contains Ecarlate de Suzy, a perfume that was described as heady and provocative. In the shape of head and neck topped with a red hat, it has the same whimsical quality shared by many of the mid-twentieth century perfume bottles in our fragrance archive. The Suzy referred to in the name of the fragrance is Madame Suzy, a prominent Parisian milliner. This late 1930s Madame Suzy red and white hat is reminiscent of the hat perched on the Ecarlate de Suzy bottle.